When I started blogging I followed two blogs very closely- ...and a Cookie for Dessert and Lauren's Kitchen. They were both local girls who cooked food very similar to what I enjoyed, so I read along and decided, "Hey, I bet I could blog like they do!" Thanks to the two of them I began this little ol' piece of the internet right here. They have both since stopped blogging (grrrr) but somewhere along the line I was fortunate enough to meet them in person and go from just internet stalking them to being their friend in real life. We get together several times a year for dinner and always go to the same place. Last time I was there I got chicken fra diavolo and was obsessed. It was so spicy and creamy, but not heavy. I loved it so much that I felt I needed to make it again- immediately. I ended up making it a week later and I'll tell you... my remake was pretty close! John and I both greatly enjoyed this dinner. I think this is one of those meals I will make again...and again... and again! 1- In a large skillet heat the oil. Add the garlic and red pepper flakes, cooking until fragrant, 3-4 minutes. 2- Add the tomato sauce and allow to cook over a low heat for about 15 minutes. 3- Meanwhile, cook the pasta according to packaging directions. 4- Stir in the cream and cook an additional 10 minutes over medium/low heat. 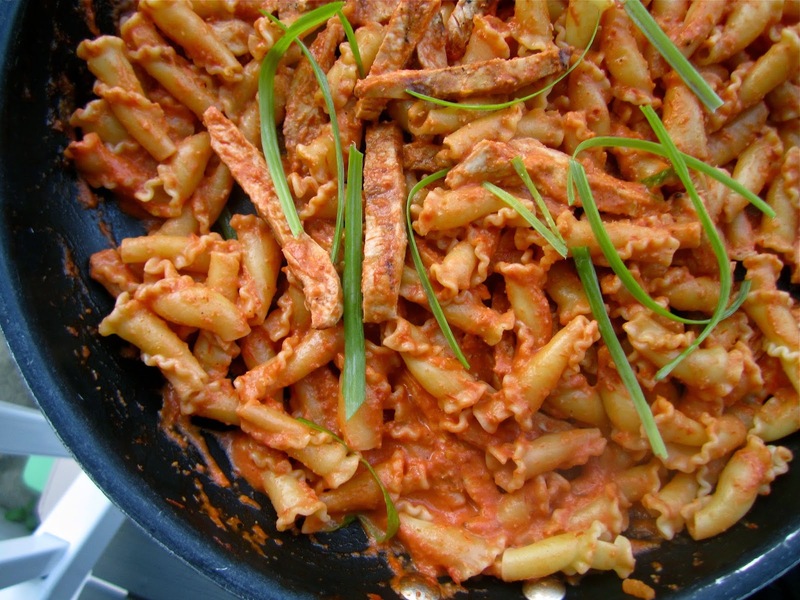 5- Toss in the cooked pasta and grilled chicken. Allow to heat altogether for about 5 minutes. 6- Top with sliced green onion. Serve hot. My mouth is watering. I have to make this, thanks for sharing!